This week started out disastrously. Well, to be fair, this week actually started out with a lovely three plus miler that was successful mainly because I was listening to Mindy Kaling read this book. I had no time to complain, get bored, or check the time because she distracted me with stories that made her sound a lot less like Kelly Kapoor from The Office and a lot more like an awkward geek writer who also happens to be obsessed with comedy…and fashion. I kept laughing aloud during my run, which I think weirded people out marginally more because when I work out, I always look about two steps from a heart attack. There’s nothing people want less than to have to help a chubby, sweating girl in cardiac arrest, unless it’s to help one also having some sort of psychotic break. But I wasn’t (having either a heart attack or breakdown) – I just couldn’t help but laugh when I heard some of my own embarrassing experiences happening to someone else. It wasn’t until I was in the car driving home, trying to do that thing where I hover over the seat to avoid creating a sweat stain on the leather, when my mother called. “Do you know there’s something wrong with the blog?” She asked. Without a doubt, my mother is my number one fan, which is probably why she sounded like someone had run over the dog when she asked me this, and also why she noticed that she hadn’t received Monday’s post in her email yet. I obviously don’t follow myself (narcissism has to draw a line somewhere), so I don’t get any notification when posts appear, and since I had finished it late Sunday night, I probably wouldn’t have looked again until someone had commented. In short, my answer was no. I pulled over, told her I’d have to call her back when I got home (and yes, my car does have hands-free calling, which is only relevant because someday I’ll go on a rant about people talking on cellphones while driving and I don’t want a bunch of people pointing to this entry and calling me out; furthermore, I only answered in this instance because I was on an empty back road and was high on endorphins – normally, I ignore the hell out of that thing, in or out of the car). I checked my email, saw no special notification and drove home in a sort of angry haze of panic. The rational part of my brain said “Shh – everything will be fine,” while the hysterical computer-phobic wussy side was already weeping furiously. The drive home took less than ten minutes, and when I got back, after confirming that the site had been shut down due to a breach in the Terms of Service agreement, I forced myself take a shower so I wouldn’t punch a hole through my monitor Hulk-style. In retrospect, I think I was mostly upset for two reasons. One: nothing so effectively kills a hard-earned audiobook jogging buzz like a time-consuming and unexpected internet issue. Two: If you have read this blog for more than a few weeks, you probably have gathered that I’m an anxious person who hates confrontation and even a perceived breach of authority. I am a rule follower. I don’t cheat, steal…well, I do jaywalk, but I’m originally from Boston, so I consider that an excusable crime. Basically, to have this site shut down without any written warning beforehand made me feel like a criminal. I was not told what I had done specifically to deserve the action, and although I deduced that it was related to posting Amazon affiliate links, I had carefully read the Terms of Service before I started posting them a few months ago and thought I was in the clear (if you’re curious, here’s why I believed that, from the ToS: “Amazon.com and other select affiliate links are permitted so long as they are not the primary content of the blog in question. Other exceptions are made on a case-by-case basis.”) For the record, I’ve made twelve cents since I started adding those. Do you know what you can buy with twelve cents? Like, three of those mini Tootsie rolls. I’m not running a scam. I’m not pimping any particular authors, and I haven’t received compensation for these reviews. I just like giving my readers the opportunity to buy the books quickly and cheaply, and I thought it would be nice for the authors to get the occasional buy from my recommendations. It’s a hard business selling books, and if I can make a writer’s day a little better by spreading the word about a book I genuinely enjoyed, great! If not, that’s fine too (since, as previously mentioned, I get nothing either way). Although the service rep I dealt with was very pleasant, and he told me what I needed to do to get the site back up quickly (remove the links from every post, which, for the record, cannot be done with anything but slow, tedious clicking), I was shocked and hurt that WordPress would think so poorly of one of its users as to refuse to give me the benefit of the doubt before throwing me into a frenzy, when what I really should have been doing on a Monday morning was working on writing I do get compensated for. Now, I’m sure they use some sort of automated system to scan for ToS breaches. And I’m sure the company does have to enforce its rules with a draconian hand to keep a tight lid on scammers. I’m not asking them to change the rules, and if I misunderstood the Terms, it’s not a big deal to lose the links. It would have been nice to get an email though – preferably before, but really, even after the fact – so that I could take care of the situation as quickly as possible to avoid inconveniencing my readers. The bottom line is, it felt badly to be treated like I had intentionally or ignorantly trampled on the rules, when it was actually just a misunderstanding. And on the plus side, I realized two valuable lessons from all of this. One, audiobooks are my new best friend when it comes to working out joyfully. Two, writing these reviews and hearing from people around the world who love books as much as I do has become hugely important to me. You, with your enthusiasm for the written word, keep me up late reading books on my blindingly bright (grumbles my husband) cell phone just so I have something interesting to write about. You have even proven to be the motivation I needed to jump into this new phase of listening to books while I’m on the move because I have to keep up with the insatiable desire we share to talk about the next surprisingly wonderful story. I’m lucky to have you all, and I’m really glad to still be here. PS If you missed Monday’s post in all the kerfuffle, you can check it out here. 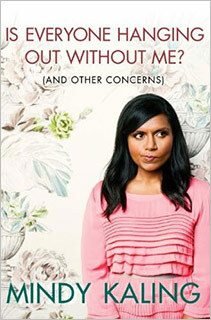 I loved Mindy’s book! She’s hilarious! Have you checked out her new show on Fox? It’s quite entertaining. Mindy for the win! I watched the pilot on Tuesday right after I finished her book. I was a little surprised by how much I loved it! Sitcoms, and especially the first episode of sitcoms, often leave a lot to be desired, but she nailed it. I hope it continues to be awesome!